Eva-Maria Stoebe, a native of Germany now a naturalized American citizen, was a member of the German Dressage Team from 1971-1976. She rode her own horses up to Grand Prix level across Germany, Austria and Belgium, and trained with Willi Schultheis, Herbert Rehbein, Josef Neckermann and General Albert Stecken. 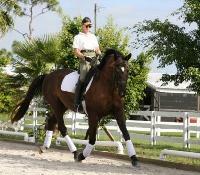 Eva moved to Sarasota, Florida as the head dressage trainer at Chain Link Ranch in 1977, remaining until 1986, when she moved with her four German-bred horses to Happy Day Farm in White Fences. She moved to White Fences because of her connections in the international dressage world and her friendship with the White Fences developer, Dr. Howald and Gisela Pferdekaemper.